Elegant and refined mood lighting defines a room and can create a bold statement without overwhelming the space. 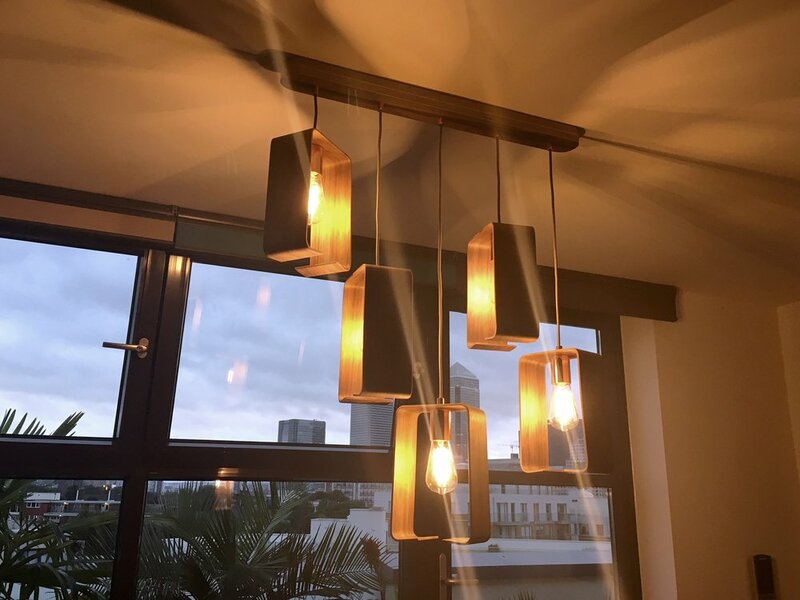 Lozi can create individual lighting, either adapting an existing design or creating something unique just for you, that will set the mood of your space. Finishes, sizing and design details can all be tailored to your needs. Sustainable hair salon Buller & Rice wanted some unqiue lamps to ahng above their reception desk. 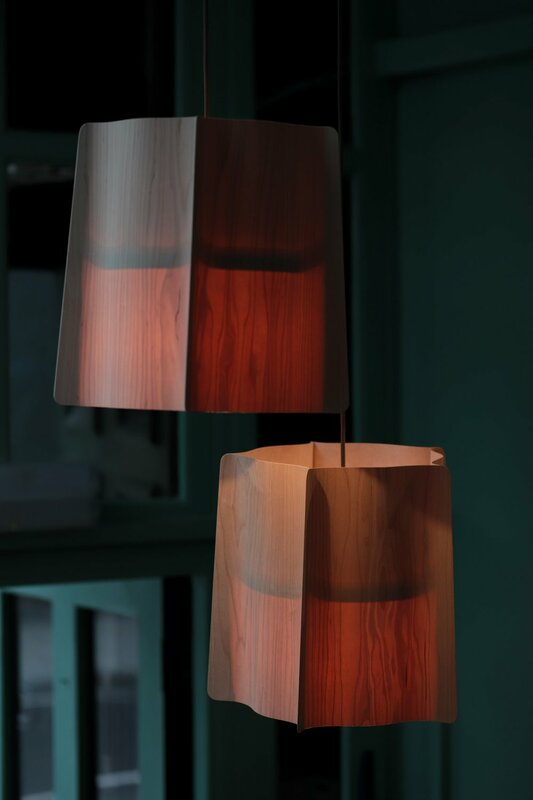 The translucent cherry veneer lets through a gentle glow, bringing warmth to the space and tying in seamlessly with the dark wood seen throughout. The gentle curves mirror the smooth corners found in the other pieces we created for this salon. Inspired by our sunset lamp, Georgina wanted a statement piece for her kitchen. Working with a long but quite narrow space, Lozi created this undulating. A single seamless piece of veneer comes to life, glowing gently and showcasing the beautiful striations, whilst the open base lets more than enough light through to cook up a storm. 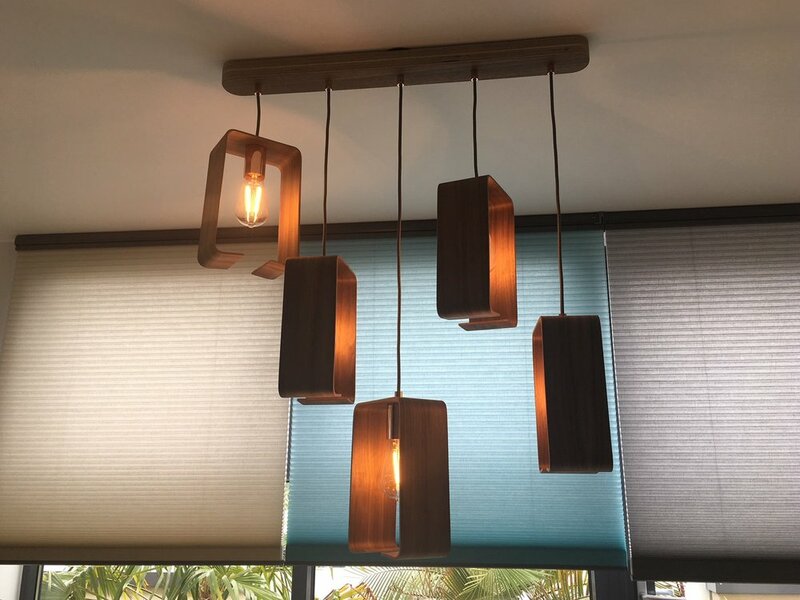 Using our Fab Pendants as a starting point, we adapted this design to create a bespoke chandelier for Miranda to hang above her dining table. One of our more fun projects, Lozi created these jaunty film reel lights for the iconic east London Rio Cinema as part of our sponsorship of the downstairs bar renovation. A film reel shaped cutout shadows translucent pine veneer, harking back to old shadow puppets shows. They will hang along a corridor, lighting the way to their second screen.